Minks were successfully raised for profits from their pelts until the late 60s when the supply outnumbered demand and the production costs outweighed profits. During this time, many mom and pop mink farms went out of business. Even so, minks are still the primary animal raised for profits from their pelts, with the vast majority of mink farms located in the northern states. Unlike the European mink, the American mink animal is not endangered and has an abundant population. Its long, sleek body is approximately 2-feet long with a pointed snout, short stout legs, webbed feet, small ears and eyes with a long neck and tail. In fact, the tail encompasses one-third of the animal’s overall body length. It generally weighs around 25- to 56-ounces. The animal’s prized fur is brownish to black, with a bit of white on its chin and throat. The soft, glossy fur is coated in an oily substance making it waterproof. The animal molts twice yearly, once in April and again in late summer. The average lifespan of a mink animal in the wild ranges around three to seven years, with domesticated minks living around seven years. Their mating season beings in February and lasts for several months. The gestation period lasts for 40 to 75 days when a litter of one to eight ‘kits or cubs’ are born. The kits remain with the mother for approximately six months when they become independent and strike out on their own. Female minks are known as "sows" and male minks "boars." Mink animals typically lead the life of a loner and only come together during mating season. They typically reside in forested areas near rivers, streams, ponds, lakes and marshy areas where there is tree cover. The mammal is semi-aquatic and spends quite a bit of its time in watery areas searching for food. Minks are nocturnal and are active year-round. They make their homes in hollowed logs or dens of other animals, such as muskrats or beavers. Minks will also dig a den along stream banks. The mammal makes its home a bit cozier by lining it with leaves, fur and grass. The range of the American mink is quite diverse. It stretches into Canada and down through the southeast, reaching downwards through Florida. Minks are absent in portions of the west and southwestern areas of the country. Mink animals are carnivores, sustaining themselves on a diet of frogs, fish, chipmunks, muskrats, rabbits, mice and birds. It is an aggressive predator and will often go after prey much larger than itself, making the kill by biting into the throat. Minks will also kill snakes but don’t eat them. Leftovers are never a problem because the mink stores the extra food inside their dens. The American mink makes a tasty meal to other predators. Wolves, owls and foxes all are predators to the mink. 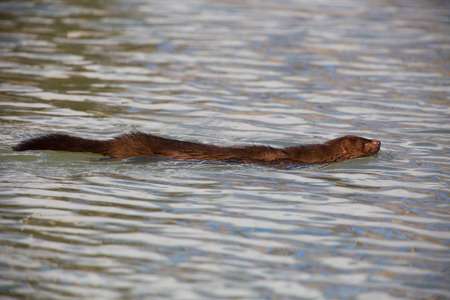 A good swimmer, minks can dive up to 16-feet deep and remain in warm water for up to three hours. They cannot remain in cold water for very long. Mink animals can also climb trees. The mammal’s eyesight is better on land than it is on the water and their sense of smell is weak. When hunting for prey, they rely heavily on their auditory glands. Minks are very territorial and mark their personal areas. Male minks will fight each other if one enters into the other’s territory. If threatened, the mink snarls and hisses and like a skunk, will spray an intruder with its fowl-smelling substance. However, the mink cannot aim its spray like a skunk. When happy, minks purr like cats. The American mink is quite intelligent, though it can take some time to tame and the best success in taming a wild mink is its capture while very young. Once tamed, a mink will dominate any cats in the area and will assist the feline in capturing rats and mice and driving them from their holes. 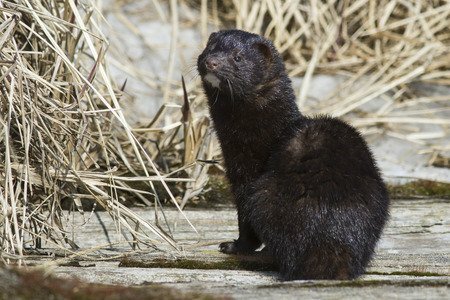 American mink animals have been farmed for their fur for a century and through the process of breeding, domesticated minks are larger than wild ones. 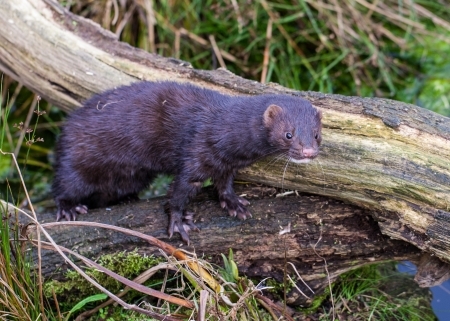 Domesticated minks should not be released back into the wild because they create problems with the wild population, as well as the ecosystem. They can create a population explosion and due to their larger size, the domesticated mink can either kill local mink populations or drive them from their local habitat. Unlike their European cousins, populations of the American mink are quite healthy and those searching for the elusive mammal will find them throughout vast portions of the country. Remember, minks are intelligent and will probably hear you coming through the woods before you ever see them.